The walk from my apartment in Greenwich Village to my studio in Tribeca takes about twenty minutes, depending upon the route and whether I stop for a coffee and the Times. Invariably, though, it begins with a trip down the stairs. And so sets out architecture critic Michael Sorkin on his daily walk from his home in a Manhattan old-law-style tenement building. Sorkin has followed the same path for over fifteen years, a route that has allowed him to observe the startling transformations in New York during this period of great change. Twenty Minutes in Manhattan is his personal, anecdotal account of his casual encounters with the physical space and social dimensions of this unparalleled city. From the social gathering place of the city stoop to Washington Square Park, Sorkin’s walk takes the reader on a wry, humorous journey past local characters, neighborhood stores and bodegas, landmark buildings, and overlooked streets. His perambulations offer him—and the reader—opportunities to not only engage with his surroundings but to consider a wide range of issues that fascinate Sorkin as an architect, urbanist, and New Yorker. Whether he is despairing at street garbage or marveling at elevator etiquette, Twenty Minutes in Manhattan offers a testing ground for his ideas of how the city can be newly imagined and designed, addressing such issues as the crisis of the environment, free expression and public space, historic preservation, and the future of the neighborhood as a concept. 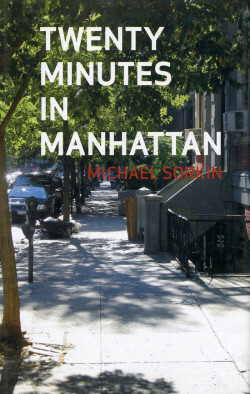 Inspired by Sorkin’s close, attentive relationship to his beloved city, Twenty Minutes in Manhattan is in the end a valentine to the idea of the city that ultimately offers a practical set of solutions that are relevant to not only the preservation and improvement of New York but to urban environments everywhere.